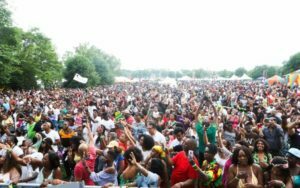 The 3rd Annual Grace Jamaican Jerk Festival was held in Washington, D.C. this past Sunday June 10th and there was no shortage of good food and good vibes as over seven thousand patrons packed the Festival Lawn at RFK Stadium. The Festival was a great way to honor and celebrate June as Caribbean American Heritage Month. 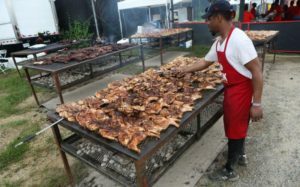 Patrons enjoyed delicious jerk and Caribbean delicacies from vendors such as Spice- A Caribbean Jerk Joint, Sunrise Caribbean, Yogi’s Jerk Festival as well as tasty beverages by Pines and Iceez and more as they roamed the grounds. The Shoppers Culinary Pavilion held an array of cooking demonstrations and tastings by Chef Irie, host of Taste the Islands television show on PBS. Washington, DC’s own Chef Giovanni Merle and Chef “Jumoke” Jackson who showcased tasty recipes for patrons to sample. On the musical side, New Kingston wowed the crowd with their new music and some recognizable covers. Reggae Ambassadors, Third World, performed their string of popular hits and reggae classics. Soca queen Alison Hinds brought a taste of carnival to the venue with her party anthems while self-proclaimed energy God himself, Elephant Man delivered his a very lively set that the crowd couldn’t get enough of. DJ Ricky Platinum gave the crowd life between sets with a selection of dance hits and club favorites while Veteran radio personality, Tony Carr, host of “This is Reggae Music” along with Ragashanti, of Tambourine Radio” performed MC duties. A Patty Eating Contest kept the crowd entertained as Rohan Gillings came in first place with the most patties ate in a minute and India Reid in second place. Other festival features included an interactive Kid’s Zone offering face painting, rides and storytelling for the young ones. Beyond food, there was plenty available for purchase from Island flavored clothing, unusual novelties, trinkets and more. Almost everyone who came left with a taste of the Caribbean from the food and beyond. The New York Grace Jamaican Jerk Festival will be held July 22nd 2018 at Roy Wilkins Park and will offer more jerk delicacies along with music from Elephant Man, Patoran King, Hood Celebrityy, L.U.S.T., Jahmiel and New Kingston. Tickets are available at https://jerkfestivalny.com/. The annual Taste of Jerk launch event will be held this Saturday at the VP Records Retail store.